Professional Audio since 1988 "Owned and operated by engineer/producer Dennis Field Featured on Much Music News, Going Coastal, Global Noon, Live at Five and CTV. Q104, CKBW. 89.9 Hal FM Judge at the 2007, 2008, 2009, 2010 ECMA Awards. 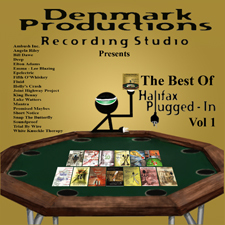 Judge at the 2000, 2003, 2005 2006, 2007 and 2008 Juno awards"
Here you will be able to purchase artists CD's that have been recorded, mixed or mastered at Denmark Productions. All you need to do is select the artist you are interested in, take a listen to the sample and if you like what you hear simply click on the image and you will be directed to Paypal (secure online payment center). www.paypal.com There you can use most credit cards or bank accounts to pay for your item. We will then ship the CD to the address registered with Paypal, it's that easy. If you would like to send a money order, please add $6.00 shipping & Handling to the purchase price, made out to Denmark Productions and send to 33 Punch Bowl Dr Suite 101 Halifax NS Canada B3P 2C4. Please include your full address and which CD you have selected. CD Sample "A Mother's Love"
CD Sample "Pray Death Do Us Part"
CD Sample "Hands Of A Pharaoh"
CD Sample "lifted to the windows"
CD Sample "Find The Time"
CD Sample "Apostasy For Santanas"
CD Sample "Drifton From Dream To Dream"
CD Sample "Ah si mon moine"
CD Sample "And The Children Came"
CD Sample "You're Sailin' Without Me"
CD Sample: "Strong Hollow" "CRANK"